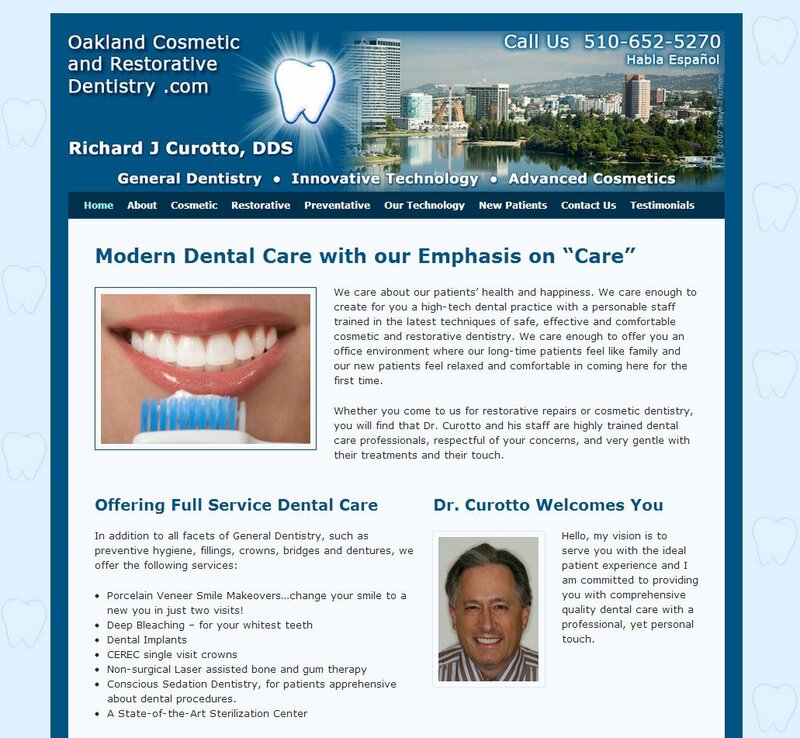 Dr. Curotto has been my client for eight years now and the website for his dental practice has evolved through several iterations during that time. 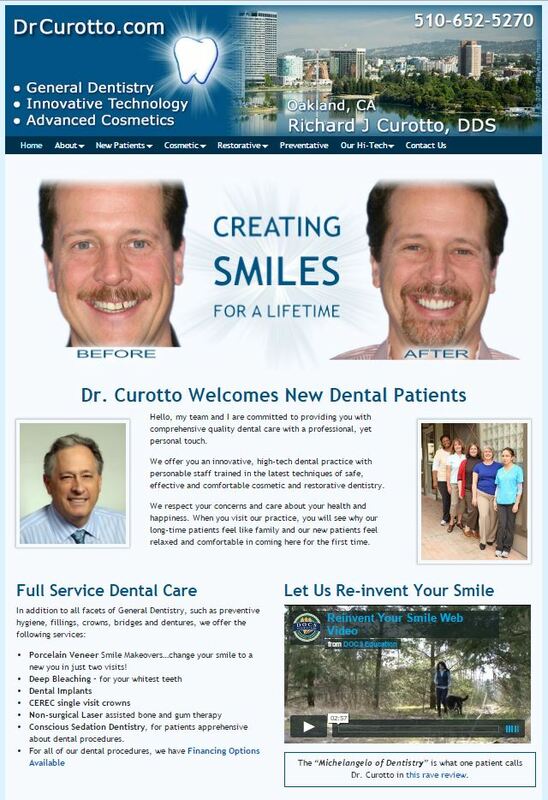 This latest visual makeover (April, 2015 – images of new home page layout are adjacent) incorporates the byline, Creating Smiles for a Lifetime, front and center, between before/after photos of actual patients. 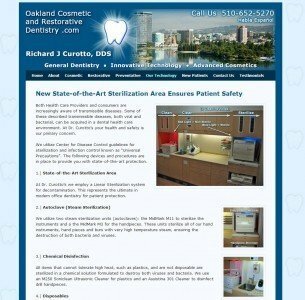 Lower down on the page, the dental care services are itemized next to a short patient-education video. Then the narrative flow continues with a benefits summary of the innovative dental technologies utilized leading to the desired end result: happy patients sharing their smiles in social situations. Further “social proof” is then presented with links to social media accounts and review sites (Yelp.com and DemandForce, with the 5-star, 99%+ rating). 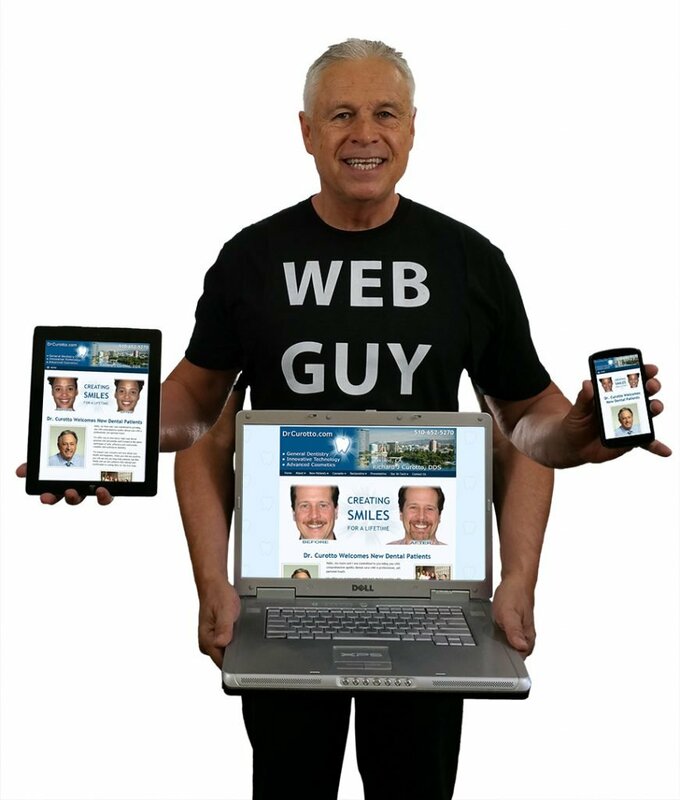 The pages closes with a clear call to action: “Call our office today,” with the phone number in large, bold text, which, when viewed on a mobile phone, will initiate a call to the dental office with just one tap. 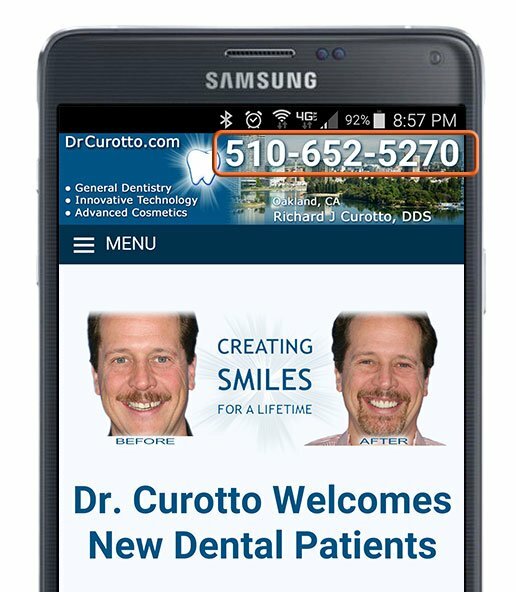 The office phone number displayed in the header area is also coded to make a call with just one tap, with the accessibility enhancement of the number retaining large-sized digits, even while the header shrinks on mobile phones. This website for a family and general dentistry office in Oakland, California has gone through several rebuilds in the past four years. 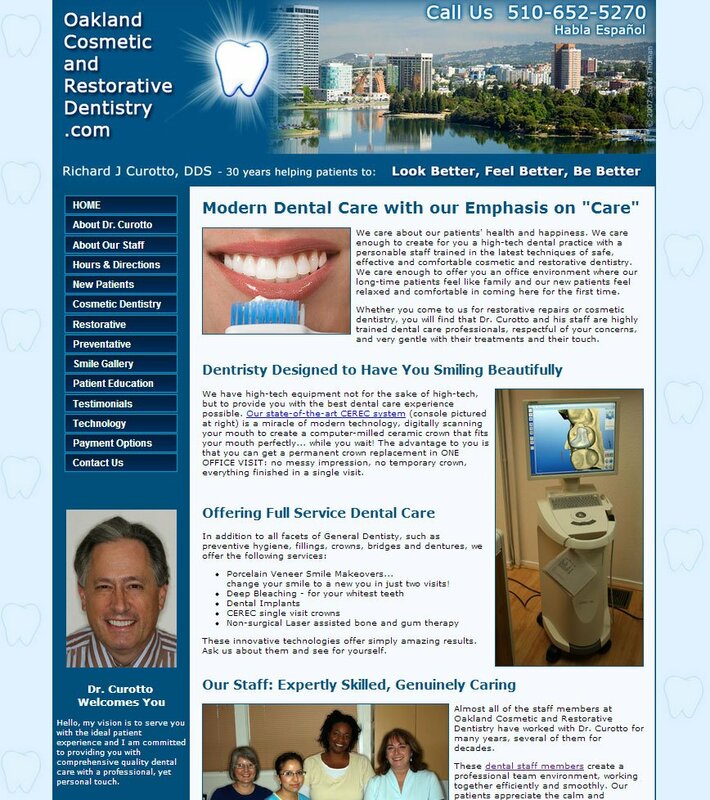 I built much of the original site in HTML, but shortly thereafter converted it to WordPress, because it was so much easier to implement the photo galleries of before/after dental work. In the spring of 2012, the site was renovated to a “responsive web design” theme, so the site could rearrange its layout appropriately when viewed on mobile devices. 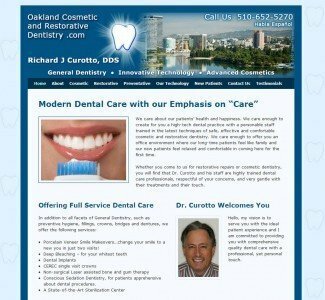 Many of the photographs of office location, staff and medical equipment were taken by me when I made visits to Dr. Curotto’s practice to discuss and review the design of the website. I also wrote much of the text, working from note or articles given to me by the doctor. 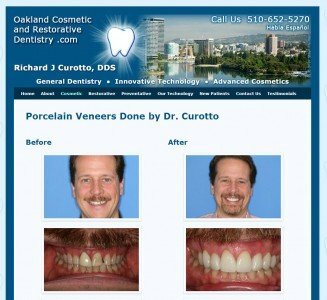 The before/after photos of patient’s dental work were taken by office staff. 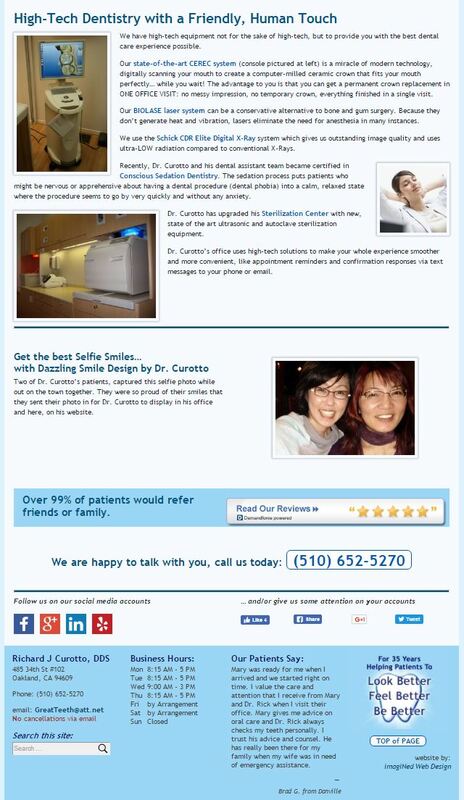 Dr. Curotto uses Demandforce, a third party service that collects patient reviews, ratings and commentary. I’ve integrated the data feed from the Demandforce servers to automatically update the doctor’s Testimonial Page with the latest reviews for his dental practice within minutes of their being submitted.